The rare-earth (lanthanide) elements are metals that are ferromagnetic, meaning that like iron they can be magnetized to become permanent magnets, but their Curie temperatures (the temperature above which their ferromagnetism disappears) are below room temperature, so in pure form their magnetism only appears at low temperatures. However, they form compounds with the transition metals such as iron, nickel, and cobalt, and some of these compounds have Curie temperatures well above room temperature. Rare-earth magnets are made from these compounds. The greater strength of rare-earth magnets is mostly due to two factors. First, their crystalline structures have very high magnetic anisotropy. This means that a crystal of the material preferentially magnetizes along a specific crystal axis but is very difficult to magnetize in other directions. Like other magnets, rare-earth magnets are composed of microcrystalline grains, which are aligned in a powerful magnetic field during manufacture, so their magnetic axes all point in the same direction. The resistance of the crystal lattice to turning its direction of magnetization gives these compounds a very high magnetic coercivity (resistance to being demagnetized). Second, atoms of rare-earth elements can have high magnetic moments because their orbital electron structure contains many unpaired electrons, in contrast to other elements, in which almost all of the electrons exist in pairs with opposite spins, so their magnetic fields cancel out. This is a consequence of incomplete filling of the f-shell, which can contain up to 7 unpaired electrons. In a magnet it is the unpaired electrons, aligned so they spin in the same direction, which generate the magnetic field. This gives the materials high remanence (saturation magnetization Js). The maximal energy density BHmax is proportional to Js2, so these materials have the potential for storing large amounts of magnetic energy. The magnetic energy product BHmax of neodymium magnets is about 18 times greater than "ordinary" magnets by volume. This allows rare-earth magnets to be smaller than other magnets with the same field strength. Some important properties used to compare permanent magnets are: remanence (Br), which measures the strength of the magnetic field; coercivity (Hci), the material's resistance to becoming demagnetized; energy product (BHmax), the density of magnetic energy; and Curie temperature (TC), the temperature at which the material loses its magnetism. Rare-earth magnets have higher remanence, much higher coercivity and energy product, but (for neodymium) lower Curie temperature than other types. The table below compares the magnetic performance of the two types of rare-earth magnets, neodymium (Nd2Fe14B) and samarium-cobalt (SmCo5), with other types of permanent magnets. Samarium–cobalt magnets (chemical formula: SmCo5), the first family of rare-earth magnets invented, are less used than neodymium magnets because of their higher cost and lower magnetic field strength. However, samarium–cobalt has a higher Curie temperature, creating a niche for these magnets in applications where high field strength is needed at high operating temperatures. They are highly resistant to oxidation, but sintered samarium-cobalt magnets are brittle and prone to chipping and cracking and may fracture when subjected to thermal shock. Neodymium magnets, invented in the 1980s, are the strongest and most affordable type of rare-earth magnet. They are made of an alloy of neodymium, iron, and boron (Nd2Fe14B), sometimes abbreviated as NIB. Neodymium magnets are used in numerous applications requiring strong, compact permanent magnets, such as electric motors for cordless tools, hard disk drives, magnetic holddowns, and jewelry clasps. They have the highest magnetic field strength and have a higher coercivity (which makes them magnetically stable), but they have a lower Curie temperature and are more vulnerable to oxidation than samarium–cobalt magnets. Corrosion can cause unprotected magnets to spall off a surface layer or to crumble into a powder. Use of protective surface treatments such as gold, nickel, zinc, and tin plating and epoxy-resin coating can provide corrosion protection. The greater force exerted by rare-earth magnets creates hazards that are not seen with other types of magnet. Magnets larger than a few centimeters are strong enough to cause injuries to body parts pinched between two magnets or a magnet and a metal surface, even causing broken bones. 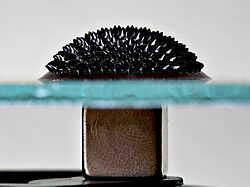 Magnets allowed to get too near each other can strike each other with enough force to chip and shatter the brittle material, and the flying chips can cause injuries. There have even been cases where young children who have swallowed several magnets have had a fold of the digestive tract pinched between the magnets, causing injury and in one case intestinal perforations, sepsis and death. The U.S. Consumer Product Safety Commission passed a rule restricting rare-earth magnet size in consumer products, but it was vacated by a US Federal court decision in November 2016. Since their prices became competitive in the 1990s, neodymium magnets have been replacing Alnico and ferrite magnets in the many applications in modern technology requiring powerful magnets. Their greater strength allows smaller and lighter magnets to be used for a given application. Stop motion animation: as tie-downs when the use of traditional screw and nut tie-downs is impractical. Diamagnetic levitation experimentation, the study of magnetic field dynamics and superconductor levitation. Launched roller coaster technology found on roller coaster and other thrill rides. LED Throwies, small LEDs attached to a button cell battery and a small rare earth magnet, used as a form of non-destructive graffiti and temporary public art. Miniature figures, for which rare-earth magnets have gained popularity in the miniatures gaming community for their small size and relative strength assisting in basing and swapping weapons between models. The United States Department of Energy has identified a need to find substitutes for rare-earth metals in permanent-magnet technology and has begun funding such research. The Advanced Research Projects Agency-Energy (ARPA-E) has sponsored a Rare Earth Alternatives in Critical Technologies (REACT) program, to develop alternative materials. In 2011, ARPA-E awarded 31.6 million dollars to fund Rare-Earth Substitute projects. ^ Cullity, B. D.; Graham, C. D. (2008). Introduction to Magnetic Materials. Wiley-IEEE. p. 489. ISBN 0-471-47741-9. ^ Lovelace, Alan M. (March–April 1971). "More Mileage Than Programmed From Military R&D". Air University Review. US Air Force. 22 (3): 14–23. Retrieved July 4, 2012. ^ McCaig, Malcolm (1977). Permanent Magnets in Theory and Practice. USA: Wiley. p. 123. ISBN 0-7273-1604-4. ^ Sigel, Astrid; Helmut Sigel (2003). The lanthanides and their interrelations with biosystems. USA: CRC Press. pp. v. ISBN 0-8247-4245-1. ^ Bobber, R. J. (1981). "New Types of Transducers". Underwater Acoustics and Signal Processing. p. 243. doi:10.1007/978-94-009-8447-9_20. ISBN 978-94-009-8449-3. ^ Walsh, Bryan (March 13, 2012). "Raring to Fight: The U.S. Tangles with China over Rare-Earth Exports". Time Magazine. Retrieved November 13, 2017. ^ Chu, Steven (2011). Critical Materials Strategy. DIANE Publishing. pp. 96–98. ISBN 1437944183. ^ Swain, Frank (March 6, 2009). "How to remove a finger with two super magnets". The Sciencepunk Blog. Seed Media Group LLC. Retrieved 2017-11-01. ^ "Magnet Safety Alert" (PDF). U.S. Consumer Product Safety Commission. Retrieved 20 July 2014. ^ "CPSC Recall Snapshot" (PDF). Alston & Bird. December 2016. ^ "Research Funding for Rare Earth Free Permanent Magnets". ARPA-E. Retrieved 23 April 2013. Peter Campbell, "Permanent Magnet Materials and their Application" (Cambridge Studies in Magnetism)(1996). ISBN 978-0-521-56688-9. Brown, D. N.; B. Smith; B. M. Ma; P. Campbell (2004). "The Dependence of Magnetic Properties and Hot Workability of Rare Earth-Iron-Boride Magnets Upon Composition" (PDF). IEEE Transactions on Magnetics. 40 (4): 2895–2897. Bibcode:2004ITM....40.2895B. doi:10.1109/TMAG.2004.832240. ISSN 0018-9464. Archived from the original (PDF) on 2012-04-25. Edwards, Lin (22 March 2010). "Iron-nitrogen compound forms strongest magnet known". PhysOrg.